Although there are a lot of machetes on the market, most of them have some issues. I know, because I tried most of them. However, I was pleasantly surprised when I found the Ka-Bar 2-1249-9 Black Kukri Machete. Simply said, it is different and it comes with features and details that other products of this type simply don’t have. As the end result, this is an amazing machete designed for any purposes. The best and the most important part of this machete is the blade. It is made from carbon steel, so it offers several advantages. The first one is that it is extremely durable and it can withstand all types of pressures and applications. On the other side, it is lightweight so carrying the machete won’t be an issue. At the same time, this blade will stay sharp for a longer period of time than with machetes that have blades made from other materials. Simply said, this machete can be used by professionals and it isn’t an ordinary blade. In addition, sharpening the blade is simple and isn’t much harder than with other machetes. The last advantage is the fact there is no reflection from the blade. 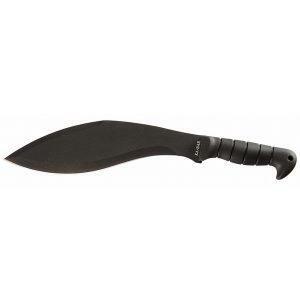 Another part of the Ka-Bar 2-1249-9 Black Kukri Machete that is special is the handle. It has been made from thermoplastic and it is ergonomic, which means that it fits perfectly in any hand. In addition, it offers a high level of grip, so you don’t have to worry about dropping this machete. The handle is designed to offer the highest level of comfort and it is perfect for all day use. If you are looking for a machete and you are planning to use it every day, this handle is more than just mandatory. On the other side, it is lightweight as well, so it doesn’t increase the weight of the machete. 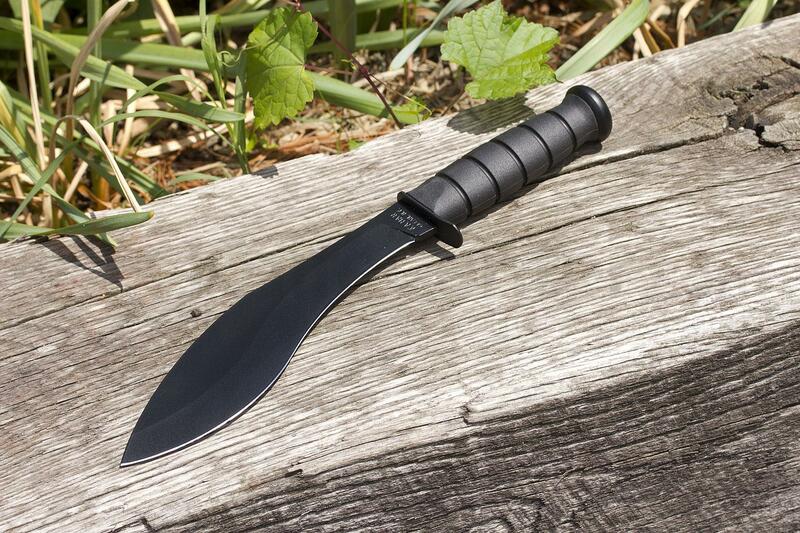 A useful addition to this machete is a sheath, made from black leather. It also offers a high level of quality and it is designed for heavy duty applications. All of this means that the machete and the sheath are perfect for use in rough areas. The machete will fit perfectly in the sheath and it will last for a long time. The design of the sheath is interesting as well, so it makes the entire package better. 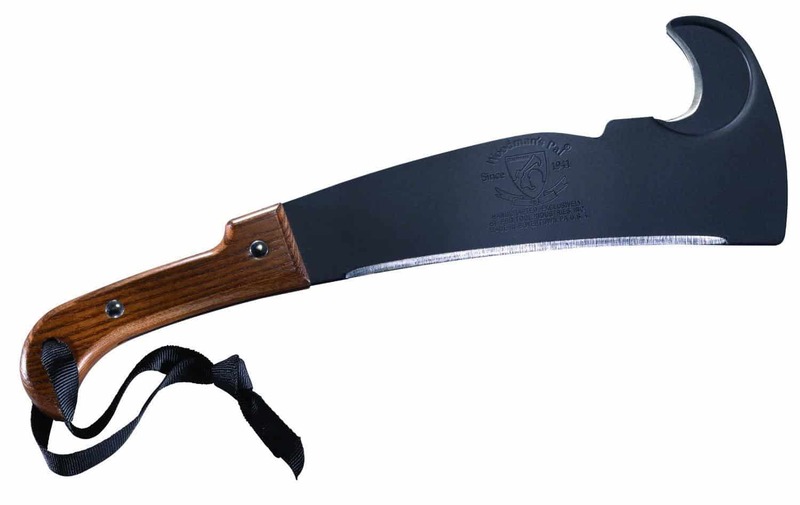 Keep in mind that this machete is used by several militaries across the world, so you can be sure that it is a professional product of this type. The best parts of the Ka-Bar 2-1249-9 Black Kukri Machete are the weight and the carbon steel blade that can stay sharp in any condition. This machete has 4.7 out of 5 star rating. Keep in mind that the Ka-Bar 2-1249-9 Black Kukri Machete is a professional and high-end product, so it is perfect for corresponding applications. It is well-made, comes with the highest level of quality and it even comes with a sheath, made from black leather. This model is used by several militaries, across the planet, so you can understand how well-made and useful it is. In addition, it is perfect for long usages and it won’t cause wrist fatigue, thanks to the ergonomic handle.